Over on YouTube user Laboenligne.ca has uploaded a review of the ColibriNANO. If you didn't already know the ColibriNANO is a low cost but high performance direct sampling receiver designed for the HF bands. Currently it costs $269.95 US from nsiradio. It now competes almost directly with the recently released Airspy HF+ which is a lower cost $199 unit with similar performance specifications. Laboenligne.ca's review initially goes over the specs of the ColibriNANO and usage of the free ExpertSDR2 software that is used with the ColibriNANO. He also shows how the ColibriNANO can be connected to a Raspberry Pi 3 and used remotely over the internet. This is similar to the Airspy's SpyServer, but the difference is that ColibriNANO's server interface works in a browser via HTML5, so it can be used on any platform including mobile devices. Of course the ExpertSDR2 software can also be used to connect to the server as well. In his review Laboenligne.ca notes that he is very impressed with the remote web interface and has set up a public server demonstration of his ColibriNANO available at vpn.laboenligne.ca. He notes that if there is no reception to try again later, as he may be using the antenna on another radio. In this video I am comparing three SDR-Receivers. I have made few recordings with every receiver with the same antenna and choose the best one (one with the best SNR = signal-to-noise ratio). My intention was to ensure the same conditions for all three SDR`s in order to make as fair as possible comparison. For example, I was set the frequency span displayed on the window to be as same as possible for all three receivers. The vertical axis for the signal stregth, was set to be equal (in decibels) too.Airspy HF+ and ColibriNANO was set to their minimum sample rate (48 kHz). RSP1A was set to minimum sample rate (2 MHz and 8 decimation). No DSP enhancing on the SDR`s was used except APF (Audio peak filter) on ColibriNANO (I forgot to swith off). Over the last few months we've been posting and getting excited about the Airspy HF+, an upcoming high dynamic range HF/VHF receiver designed for DXing. The Airspy team were kind enough to supply us with an early pre-production unit for review. Long story short, the Airspy HF+ is probably one of the best low cost SDRs we've seen for DXing or weak signal reception out there. So far few details on the availability of the HF+ have been released, but we're aware that preorders are due to start soon, and the target price is expected to be $149 USD from iTead Studio in China. What follows is the full review and comparisons against other similarly priced SDRs. The Airspy team want us and readers to understand that our review unit is a pre-production model, and apparently already the matching and thus SNR has already been improved by about 2-4 dBs, so the sound samples we provide in the review below should sound even better with the newer revision. Disclaimer: We received the HF+ for free in exchange for an honest review, but are not affiliated with Airspy. We've been in contact with the Airspy team who have helped clarify some points about the architecture and technology used in the design. 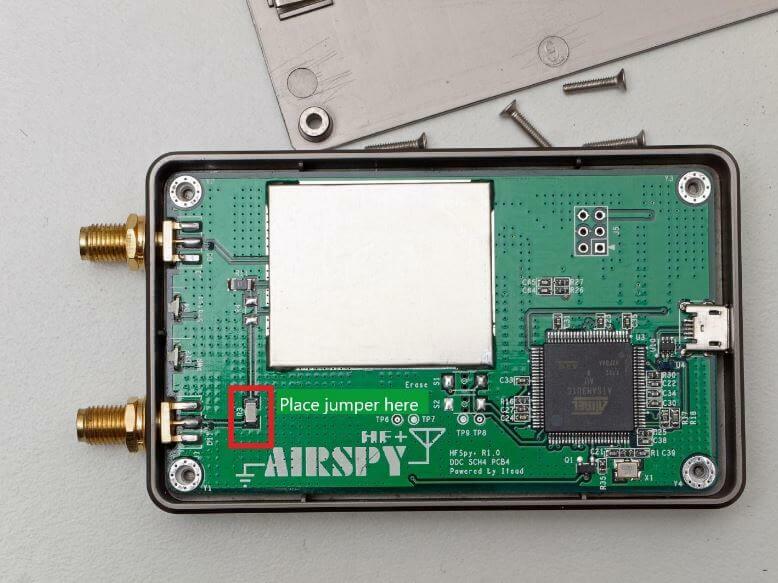 The Airspy HF+ is designed to be a HF/VHF specialist receiver with a frequency range of DC to 31 MHz, and then 60 to 260 MHz. It has a maximum bandwidth of 768 kHz. So the question is then, why would you consider buying this over something like the regular Airspy R2/Mini or an SDRplay RSP2 which both have larger frequency ranges and bandwidths? You would buy the Airspy HF+ because has been designed with DXing and weak signal reception in mind. Basically the main idea behind the HF+ is to design it so that it will never overload when in the presence of really strong signals. Combined with it's high sensitivity, weak or DX signals should come in much clearer than on the other radios especially if you have strong blocking signals like broadcast AM/FM around. Aside: What is overloading, intermodulation and dynamic range? Basically strong signals can cause weak signals to be drowned out, making them not receivable, even though they're there at your antenna. This is called overloading or saturation. Intermodulation occurs when the SDR overloads and results in images of unwanted signals showing up all over the spectrum. Filtering: Block the strong signals that you don't want using LC filters. Eye analogy: using your sun visor to block the sun. Attenuation: Reduce the strength of all signals. Eye analogy: using sunglasses or squint. Increase dynamic range: Get a better SDR with better design/technology and more bits in the ADC. Eye analogy: upgrade your eyes. The HF+ uses a typical Filter->Tuner ->ADC architecture. So it is not a direct sampling receiver like most of the more expensive SDRs. Direct sampling receivers directly sample the analogue spectrum, without the need for a tuner so they avoid losses and the intermodulation problems that usually come from the mixing stages. But there are some major cutting edge technology differences in the HF+ architecture that should make its performance even better than direct sampling receivers. Tuner: The tuner on the HF+ is one of the first to use a "Polyphase Harmonic Rejection" architecture. Essentially this means that harmonics produced in the mixing stages are naturally rejected, making the front end filtering requirements much more relaxed. So unlike the tuners used in other SDRs, this one is extremely unlikely overload in the mixing stage. An additional benefit to this architecture is that the mixer is very low loss, so the LNA in the tuner only needs to use low gain, giving it a very high IIP3 value. So the first LNA which is typically another point of saturation and imermodulation, is very unlikely to saturate in the HF+ design. Most of the amplification only occurs after the mixing stage with the filtered narrowband output of the tuner. Analogue to Digital Converter (ADC): The ADC is 16-bits and uses a "Sigma Delta" (ΣΔ) design. Basically a Sigma Delta ADC has a natural filtering ability due to its narrowband nature. Instead of seeing say a 30 MHz signal, it only sees 1 - 2 MHz, thus increasing dynamic range and reducing the likelihood of out of band overload. Digital Down-Converter (DDC): Then after the ADC is a DDC which decimates the output from the ADC, increasing the effective number of bits. The more bits the larger the resolution of the digitized RF signal, so weak signals are less likely to be lost when converted from analogue to digital. A weakly filtered signal enters the tuner, is weakly amplified by the tuner LNA, mixed down to baseband and filtered to 1-2 MHz. It is then amplified and sampled with the sigma delta ADC into 16-bits. The DDC decimates the output into 18-bits which is then sent to the microcontroller and PC via USB. The Airspy team also compiled this comparison chart for us to understand the differences in architecture between the current SDRs on the market (click to enlarge). This shows that the HF+ is a different type of design compared to other SDRs. Generally the best SDRs out the market right now are direct sampling receivers with many filter banks. The HF+ approaches the problem in a different way, and according to the specs seems to match or better the performance of heavily filtered direct sampling receivers. Over on YouTube Mile Kokotov (Z33T) has uploaded his review of the ColibriNANO, which is a $350 USD 10 kHz – 55 MHz direct sampling SDR dongle built by Russian company Expert Electronics. It features a 14-bit direct sampling ADC which is then decimated into 16-bits at bandwidths of up to 3 MHz, or 24-bits at up to 768 kHz. This should give it excellent dynamic range preventing any sort of overloading. The Colibri-NANO USB stick is a powerful direct sampling SDR receiver with frequency range from 10 kHz to 55 MHz. ColibriNANO is not another cheap USB dongle found on e-bay. This high quality SDR receiver has been developed by Expert Electronics and has strongly and solidly build aluminum body, Electrostatic discharge (ESD) protection, USB 2.0 interface and a quality SMA antenna connector. ColibriNANO has 14 bit Ananalog-To-Digital Converter, with a clock frequency of 122.88 MHz. Coverage is 10 kHz to 55 MHz, with low pass RF-filter on 55 MHz to protect from strong FM transmitters. The filter can be turned off so you can use the receiver in undersampling mode up to 500 MHz. In that case external filters and preamlifier (like the 2m filtered preamplifier from the same producer) is recommended for maximum results.. This excellent little SDR-receiver has nine IQ sample rates, from 48 kHz to 3 MHz so the frequency span on the spectrum window can be changed from 48 kHz up to 3 MHz. There are no bandpass filters in the device, So one can think that a 14-bit Analog-To-Digital Converter may be subject to overload if you have powerful transmitters nearby. But the software has extensive RF gain control, so you should not have to worry too much. As I said before the Analog-to-Digital Converter in this wonderful SDR-receiver uses 14 Bit, and with decimation process results in an excellent 110 dB Blocking Dynamic Range. The Colibri-NANO can be operated directly attached to the computer of the user, or can be used remotely at a distant location. This is done with the freely available ExpertRemote software. At the location of the SDR a small computer is required (for example a Raspberry-Pi) and for the internet connection can be used a relatively slow internet link. This, for example, allows you to use the SDR receiver at some quiet location anywhere on the world. And the important thing is that All new versions of the software are free! To control the ColibriNANO via Internet you need freely available ExpertRemote system, based on the client-server connection. This system allows you to place the receiver and server in the remote location with low RF-noise but has the internet connection. This might be some remote village or place with no electrical interference and 3G/4G Internet (or any other connection type). Using the ExpertRemote system you can enjoy in clear noiseless reception from your phone, tablet, notebook or PC. Even simple antennas, placed in a “quiet” place, allows you to listen weak signals from the DX-stations better than in urban area filled with all kind of RF-noise. Another feature of this system is that the receiver’s software can be synchronized with transceivers and be used as the panorama adapter with high resolution. In that way you can use the transceiver to transmit signals, and receive on your remotely located receiver via the ExpertRemote system. The ColibriNANO can be used with third party software like HDSDR etc. You can find more information about this great 14 bit SDR-receiver on Expert electronics official website. This device appears that it will soon compete with the Airspy HF+ which is an upcoming SDR that claims similar performance for HF. We will work on comparing the two in a later review post. Vasily Vasiliev, Chief Hardware Engineer of Expert Electronics is pleased to announce availability of new ColibriNANO 0.01-500 MHz receiver in late April, 2017.
Notable features include the blocking dynamic range (BDR) ~110dB, native .01-55 MHz coverage with up to 500 MHz in oversampling mode, low pass filter (LPF) <60 MHz, full compatibility with HDSDR, legacy SDR#, and ExpertSDR2 software. Supported platforms are Windows® XP-10, Linux and Web-client for HTML5 browsers. No existing USB SDR receivers combine high sensitivity and broad dynamic range. Remote operation (TCP/IP) interface is built-in and offers plug-and- play solutions for Amateur, Commercial and Government applications. With the new ColibriNANO you will be able to enjoy LF, MW and Shortwave listening in many different ways. For example you can record the entire medium wave band using 1.5 MHz sampling rate, decode CW using CW skimmer, remote control the ColibriNANO by plugging it into our RPI server. There are an endless range of applications for this small SDR. All this in a tiny USB stick! This is not a cheap USB dongle found on Ebay, this high quality SDR receiver is developed by Expert Electronics and features a sturdy aluminium chassis, ESD protection, USB 2.0 interface and a quality SMA antenna connector. It looks like that this receiver may compete somewhat with the also upcoming Airspy HF+. The Airspy HF+ claims similar specs including a frequency range of 0 – 270 MHz, 14 Bit ADC and 108 dB blocking dynamic range. But the target price for the HF+ is below $200 USD.